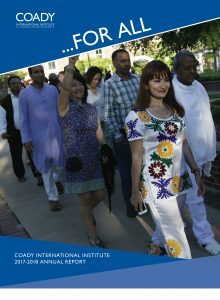 Building on the distinct historical experience of the Antigonish Movement formed 100 years ago, St. Francis Xavier University established Coady International Institute in 1959 as part of its commitment to community leadership development and social responsibility. We encourage you to learn more about how our graduates, supporters, donors, and friends are contributing to StFX’s and Coady’s commitment to social justice, social responsibility, innovation, equity, and inclusion by reading our 2017 – 2018 annual report. It is a tradition we are proud to be able to deliver … For All.